Most of our jobs require that we sit at a keyboard and type stuff all day long. When I made my Couch to Cave commitment, including walking 10,000 steps a day, I’d been watching my steps for quite some time already. It seemed that it took extra effort just to hit 6,000 on a normal weekday. Typically, I’d be in the 4,000 range. If I were super-focused on work, I’d eek out 2,500. But I made my commitment and so far I’ve kept it (granted this is only the 5th day). 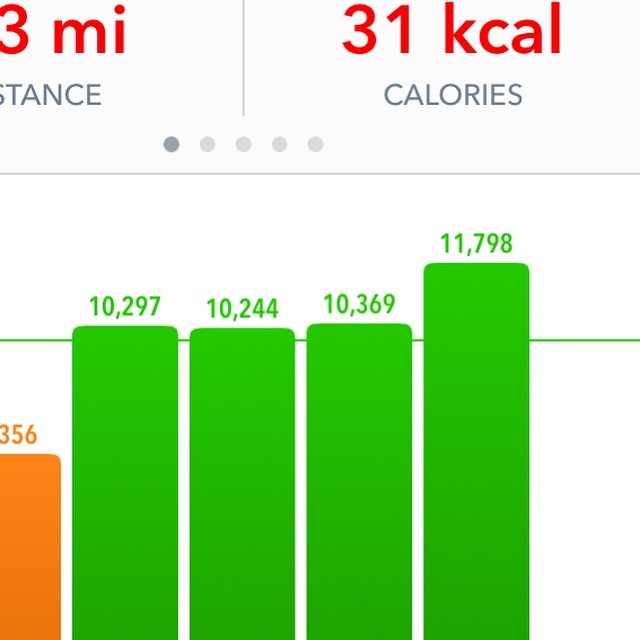 Break It Into Chunks: On the first day, I was very sporadic and had to make up for a lot of steps at the very end of the day in order to hit 10,000. My kids stared at me with confusion as I walked laps inside my house. Instead, I decided to try to h it 500 steps an hour. That is roughly .2 miles, and it’s surprisingly simple to do. Hitting this hourly goal helps keep momentum (and you normally do a few more than 500 so it adds up more quickly). Park Further Away: This practice is almost cliche. But it works. I park further from my building and walk a half-time around my building, up the three flights of steps to my office, and boom… more than 500 steps. Drink a Lot of Water: This is a good habit for a bunch of reasons, but an ancillary benefit is more trips to the restroom and more opportunities to get in a few steps (create a 500 step mini-route to the restroom and back). Stroll Target or the Mall During Lunch: You need to get out of your office anyway, go to a place where you can easily rack up 1000 steps. Oh yeah, park far away from the store. Use Your Morning Hygiene Routine: If you’re coordinated enough to walk and chew gum, then walk while you brush and floss your teeth. Pace While You Talk: Yes, while you’re on the phone, especially on the cell phone or that wireless headset, just pace back and forth. Or if someone calls you into the office and you don’t have to sit down, pace back and forth. Bonus: You’ll get out of the conversation more quickly if needed. Stop Wasting Time: The benefit of walking more? The goal is always to focus hard at work to earn the short 500 step work, and then get back to work. Don’t waste time doing other stuff. Get 1,000-2,000 (or more) in before Work: That is roughly .5-1.0 mile. Get up 15 minutes earlier and create a short route outside your house. You’ll be ahead of the game on a number of levels. A couple times, I took longer walks and got 3,000-5,000 in before the day started. Use the steps: I get 60 steps in when I walk up or down the steps to my office. That adds up over time (and is a useful part of my mini-routes). Use the Pomodoro Technique to Focus at Work: This is a sprint-based practice that calls you to focus 25 minutes straight on work, and then take a 5 minute break and then do it again for four rounds. After that, you take a 20 minute break, the back to it. Go check out the site and its free materials. About every other 5 minute break, I’ll use for my short walk (full disclosure: I might work through one of the 5 minute breaks). Become Comfortable Looking Strange: You’ll be walking a lot and if you’re creating mini-routes, you’ll probably be going to different areas of your building or walking around the outside of it with more regularity. People might think you’re casing the joint. You’re not. You’re just trying to move more and not get one of those blood clots in your legs that could kill you. Just do this thing. Bonus Idea: Figure out your own ideas. You might want to take 3 20 minute power walks to get you to the 10,000 step promised land. Or you might want to find a treadmill. Or you might schedule chores at home in a way that allows for maximum steppage. Combine the walking with other things you need to do, and I can nearly guarantee it will increase your productivity.